People of the United States hold bald and golden eagles in high value and regard. To some, they are spiritual kin. They are emblems of our country’s ideals, representing freedom, independence, courage and strength. Eagles are also apex predators critical to many North American ecosystems. When it comes to making decisions about eagle protection regulations, it’s no surprise that many people have opinions and recommendations to contribute. U.S. 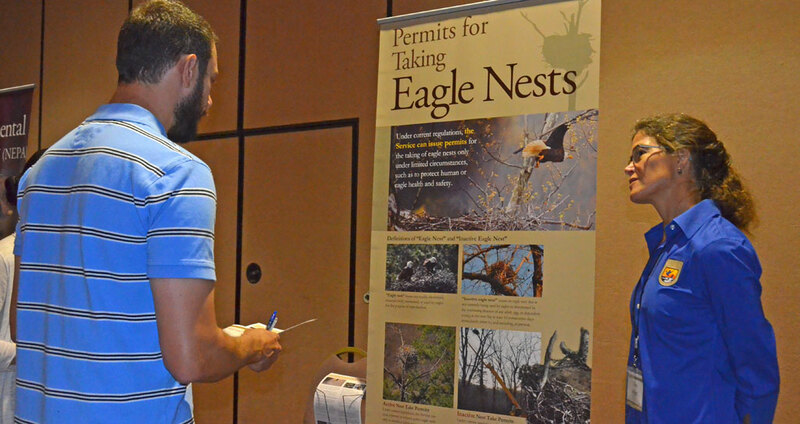 Fish and Wildlife Service scientists have engaged in discussions and gathered feedback from a wide-range of people since eagle permit rule change consideration began in April of 2012. Feedback has spanned from heart-felt emotional appeals to well-reasoned research – all valuable in helping scientists understand the complex feelings and needs of people who live with and value the presence of bald and golden eagles. Both individuals and institutions have participated in the vital, on-going exchange about the science and cultural significance of eagles. Explore the topics and public comments on this site to understand the public involvement process and to grasp the broad spectrum of insights and opinions under consideration by U.S. Fish and Wildlife Service scientists as they work to provide strong protection for eagles.